Most people don’t consider how Hollywood started and if they did they might not realise that it actually goes back to 1853. At that point Hollywood was just a hut, located on land just outside the city of Los Angeles in California. The film industry was a long way off though at that point. The area was strongly agricultural. It only became a town thanks to Harvey Henderson Wilcox. He and his wife had made the move from Kansas and developed a ranch that covered 160 acres close to the Cahuenga Pass. It was his wife, Daeida, who named the ranch after a Dutch settlement in Ohio. It was in 1887 that Wilcox created the first known document to feature the name – a grid map of the town that he was developing was submitted to the Los Angeles County recorder’s office. Hollywood Boulevard was the first street, but it didn’t carry that name at first. It was originally called Prospect Avenue. There were 500 people living in the town by 1900. By contrast, the neighbouring city of Los Angeles had a population of 100,000. Two years later work began on the Hollywood Hotel and two years after that a trolley car system was installed. However, problems maintaining a water supply to the town meant that the town residents agreed to be annexed by Los Angeles. It was around the same time that the movie industry began to develop here and it began out of necessity. 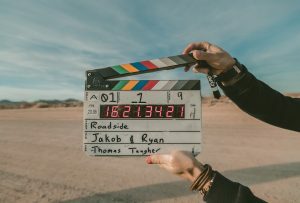 Thomas Edison’s Motion Picture Patents Company was located in New Jersey and often sued other movie makers to stop them using the same technology. In Los Angeles and Hollywood Edison was less likely to get to them. One of the first film-making companies to move to Los Angeles was the Biograph Company. Actors such as Lionel Barrymore and Mary Pickford were signed to this studio. Soon the company made the move to Hollywood. It was Biograph that made the first Hollywood movie. It was named ‘In Old California’. Soon, other film-makers were setting up shop in the same area. 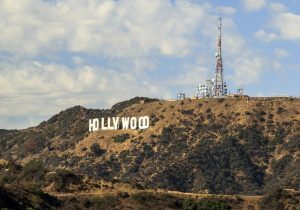 Studios started to appear around Hollywood in the early part of the twentieth century and the now famous Hollywood sign made its first appearance in 1923. First it read Hollywoodland, and was designed to advertise a new part of the town. However, the sign was badly maintained at first and the last four letters were removed in 1943. The sign is owned by the Hollywood Chamber of Commerce and it can only appear in filming with their permission. The now-famous ‘Hollywood Walk of Fame’ was established in 1956 and there are now more than 2000 stars on it. Hollywood is now home to one of the largest film industries in the world and the annual Oscars awards ceremony dates back to 1929.